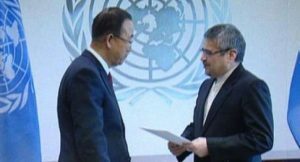 Iran has responded to claims made by eleven Middle Eastern and North African States, about Tehran’s interference in their domestic affairs in a bid to destabilize them, in a message delivered by its Ambassador and Permanent Representative to the UN Gholam-Ali Khoshroo to Secretary General Ban Ki-moon. The Ambassador claimed that the accusations that were submitted to UN’s Security Council by the United Arab Emirates (UAE), on behalf of the other states, alleging that Iran is pursing “expansionist regional policies” backed by its constitution which “calls for export of revolution to other countries” are “absurd and hypocritical” as he argues that some of the signatories to the accusations are “interfering into domestic affairs of other countries” such as Yemen. Bahrain, Egypt, Jordan, Kuwait, Morocco, Oman, Qatar, Saudi Arabia, Sudan, UAE and Yemen forwarded their concerns in the letter to the Security Council but Khoshroo said the baseless “childish” accusations are due to “Iran’s support for the right of the Palestinian people to self-determination” before counter-accusing other countries of sponsoring terrorism in Iraq and Syria among others. He described the presence of Iranian troops in Syria as “military advisory assistance” requested by the legitimate government and in accordance with International Laws before crediting their contribution to pushing back ISIS and other rebel groups. The letter once more highlights the tense relations between Iran and other States in the region as they continue to have diverging views over several key issues in the region especially in countries marred by conflicts. Written by: Jaber Ali on November 17, 2016. Posted by Jaber Ali on Nov 17 2016. Filed under Gulf News, Headlines. You can follow any responses to this entry through the RSS 2.0. Both comments and pings are currently closed.